The previous print didn't have much explicit 'seasonal' content, so it could have appeared anywhere in the set; this image also isn't very strongly 'typed' for season, but I think it suits a sunny May day perfectly! This is a reproduction, but as usual, I can't leave things alone, and have adapted it a little. What you see here is one small area 'clipped' from a full o-ban size print - one of the images in the set Azuma Fuzoku, (Household Scenes from the East) created by Chikanobu in Meiji 34 (1901). I have admired the prints in this series for a long time, and just a couple of months ago was able to obtain a number of them from an internet auction. When I was checking over the new acquisitions I noticed this young girl and immediately decided that she belonged in the Hanga Treasure Chest. 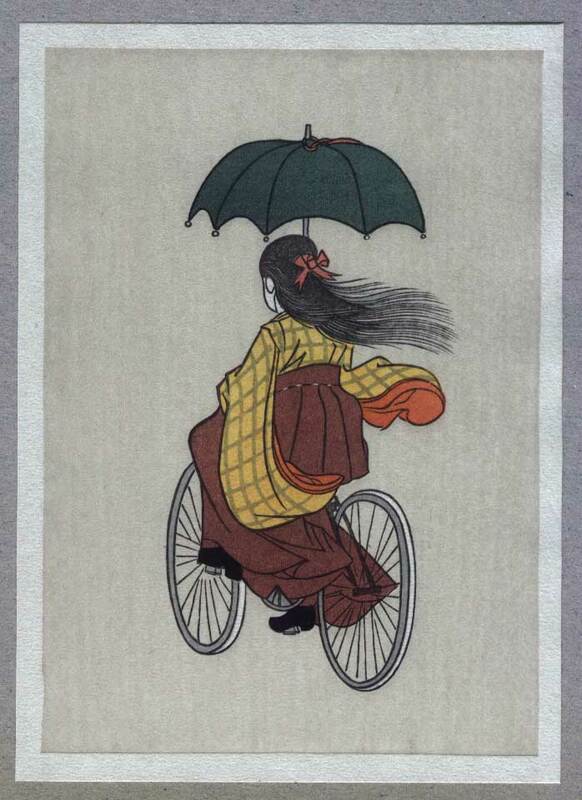 I imagine that the Meiji viewers' attention was drawn mainly to the exotic bicycle, but these days, a bicycle is nothing special at all; it is the young girl's clothing that seems unusual to us! I wonder just how common such a scene must have been back in those days? 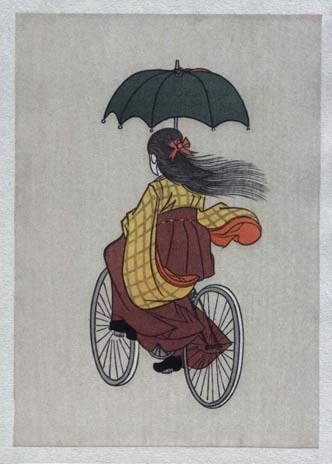 I can well imagine older folks 'tut-tutting' at the idea of a young girl sailing along in kimono on one of those 'new-fangled' contraptions, but I'm sure most young people were eager to embrace all the new technologies. Actually, this looks a bit dangerous; those long sleeves could easily catch in the spinning wheels. Perhaps that 'thrill' was part of the attraction! Just what is it that I 'saw' in this image that made me want to use it? I honestly can't say. I used to ask print dealers here in Tokyo to 'keep your eyes open for images that I can use in my work', showing them many of the prints I had made so far, and expecting that this would give them a good idea of what kind of thing to look for. I have learned that this is completely pointless - after all, if I myself can't understand what makes an image 'just right' for one of my albums, how can I expect anybody else to do so! So all I can do is keep scouting around as much as I can, and trust to serendipity to strike now and then!